We can never sneer at the stars, mock the dawn, or scoff at the totality of being. Happiness starts within. 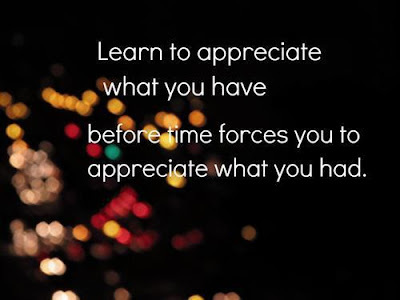 Be real, appreciate what you have, enjoy every moment, spread the love. If everything comes back, consider it as a miracle. Liking is probably the best form of ownership, and ownership the worst form of liking. Just because it isn't perfect, doesn't mean it isn't awesome. Too much of a good thing can be wonderful! When you give appreciation IN ORDER TO get something– it's manipulation and people can sense it. Appreciate genuinely. At the end of the day, let there be no excuses, no explanation, no regrets.